Social Media is no more a medium to broadcast your thoughts and connect with followers: Its now a battle ground. Social Media has transformed into a territory which brands need to conquer. Instead of speaking what you do, brands have realized that social media is the place where other people talk about you, and your existence, profits and loss, everything depends on these conversations. 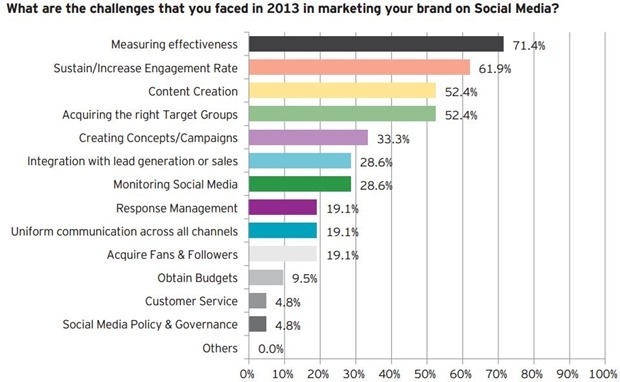 How Indian brands are responding to social media challenges of 2015? 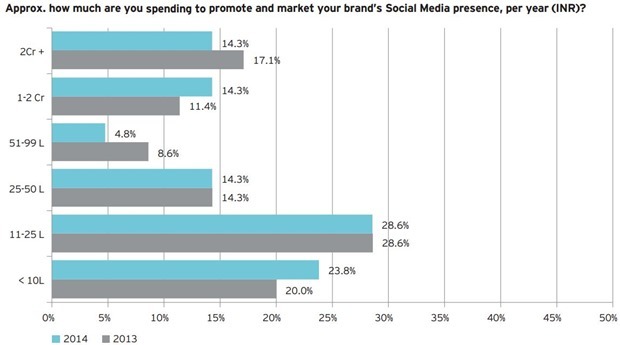 Which platforms are they working on and how much are they spending on conquering social media? Which objectives define their social media strategy and how many posts are they updating daily? Ernst & Young decided to directly ask the brands as part of their second edition of “EY Social Media Marketing India Trends Study” and tried to dig out the answers from the warriors themselves, who are slogging it out in the battlefield. Last year, their survey covered some basic pointers like their objectives, ad spends and KPIs (Key Performance Indicators), but this year, they went ahead and deeply probed the entire structure of Social Media Marketing: Internal dynamics with respect to agencies, relationship between ad spends and maturity of Indian Digital space. Some of the brands which were part of this survey include: Mahindra Holidays, HDFC Bank, Idea Cellular, Tata Global Beverages, Bajaj Finserve and more. 3 3) What is Social Media success? 4 4) How to check impact? 5 5) How much Budget? 6 6) How Much Actual Spend? 8 8) Inhouse or Outsourcing? 9 9) How much time? 11 11) Future of Social Media? Reputation Management, Thought Leadership and Recruitment are further objectives which are picking up momentum in 2014. 3) What is Social Media success? 94% of all brands said that engagement is the ultimate success check; while 89% said social reach and visitor growth as the success mantra. Other answers include: Conversions (78%); ROI (33%) and Sales (22%). 4) How to check impact? 61% of respondents admitted to using a third party social media listening tool to measure success. Radian6 and MeltWater has emerged as the most popular tools for social media listening. 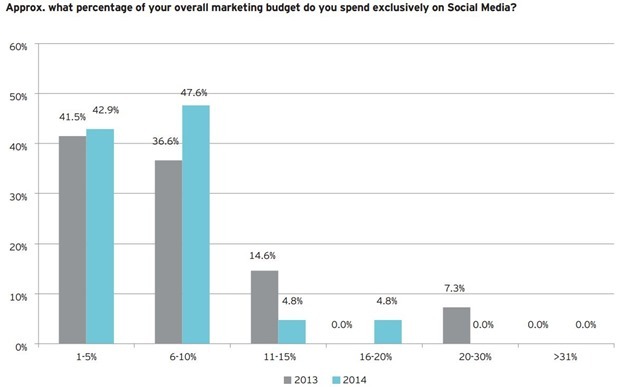 90% of all companies which were surveyed admitted that upto 15% of their overall marketing budget is spent on social media. The share of overall Digital Medium, which includes ads and SEO is much more. 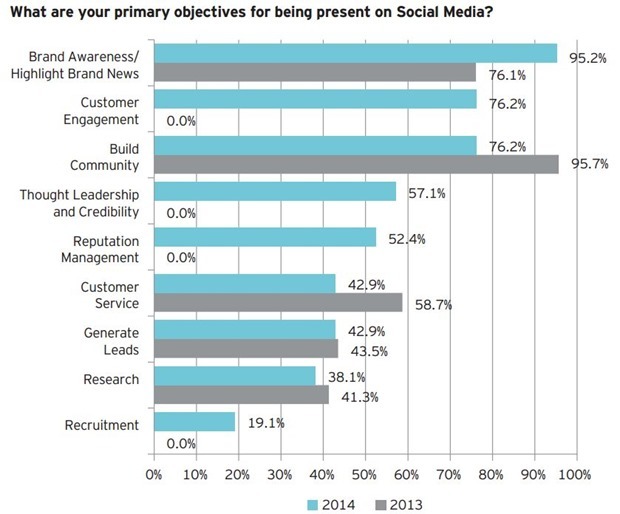 Compared to last year, only 78% of companies admitted that they even spent on social media! 6) How Much Actual Spend? 23% of all surveyed company shared that their social media budget lies between 0-10 lakh INR & 14% had budget of 10-20 lakh INR. Facebook is the number 1 platform for Indian brands as of now, followed by Twitter and Youtube. Google+ and Linkedin are the platforms which are strongly coming up; and 25% of all brands have initiated marketing on Instagram and Pinterest. 27% of all surveyed organizations had their own in-house team for strategy and implementation all social media operations, meanwhile 11% had outsourced the tasks. 67% has a hybrid model, wherein both external agency and in-house team collaborate for social media. 95% of respondents said that Marketing, Communications and PR departments handled social media, while 26% said Legal Department; 21% said HR department and 16% said IT departments handled social media. However, 79% of all respondents trusted in external social media agencies for implementation of social media campaigns and operations. 42% of brands said that they need 3 weeks to ideate, strategize and implement a campaign while 32% said 2 weeks is enough. Only one brand replied that they can deploy an end to end campaign in a week. 74% of all respondents admitted that they have created a blueprint of mobile apps and mobile based social media campaigns. Some of the mobile centric campaigns which brands have initiated include: mobile apps, responsive sites, tablet only campaigns and others. 11) Future of Social Media? "11 Powerful Insights Into Social Media Marketing in India: EY Study", 5 out of 5 based on 1 ratings.